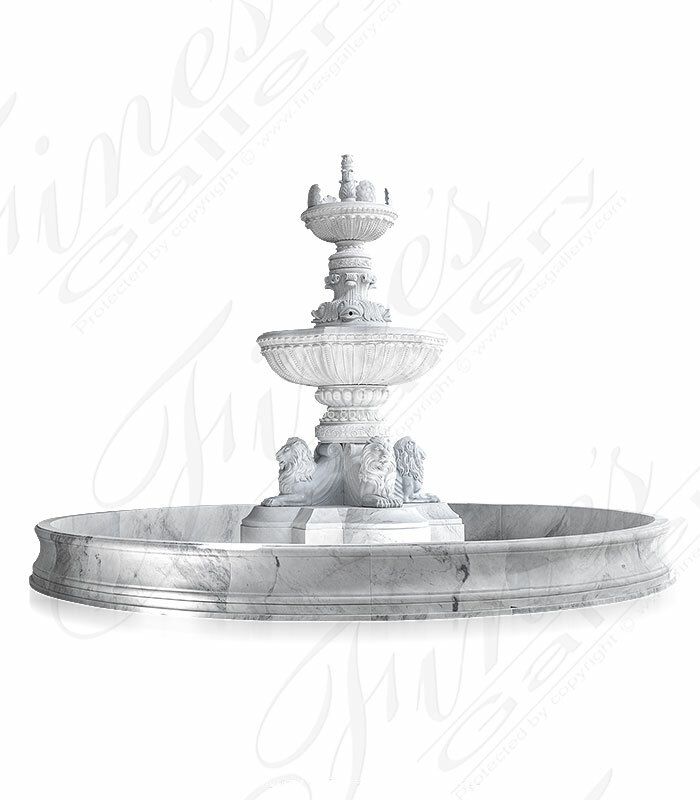 Monumental White Marble Fountain XL features hand carved solid white marble figural lions, fish and accanthus leaf finial with decorative shells to add a unique upper tier flair. 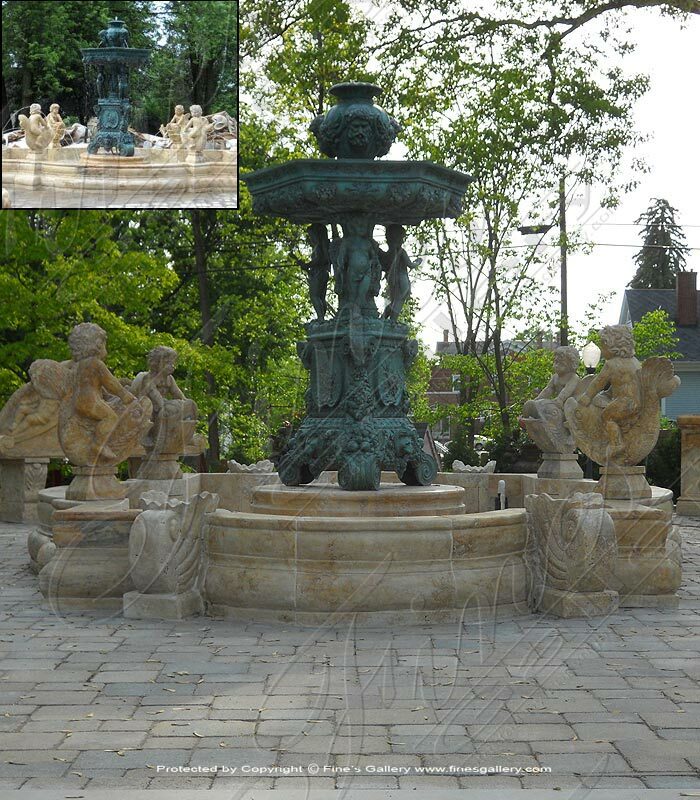 Recently installed at Mclain VA mega mansion. View at our SWFL Showroom. 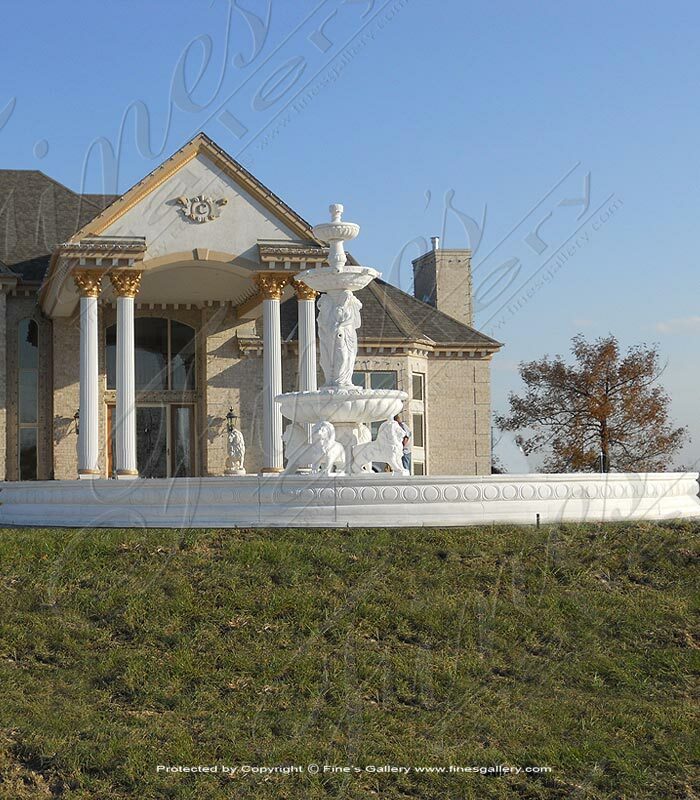 Dimensions: H: 144" W: 192" D: 192" View Colors Call Us! Dimensions: H: 144" W: 216" D: 216" View Colors Call Us! 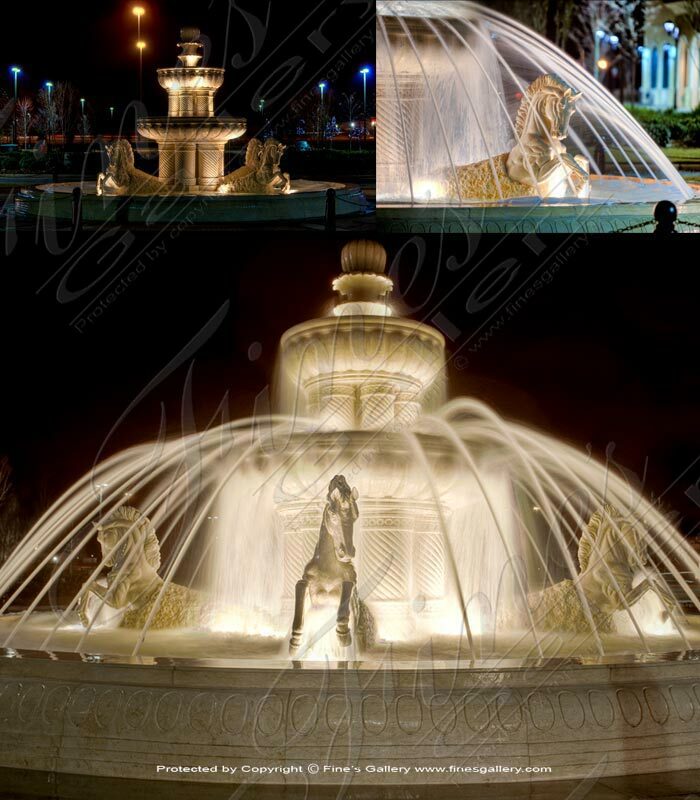 Ladies & Lions Marble Fountain. 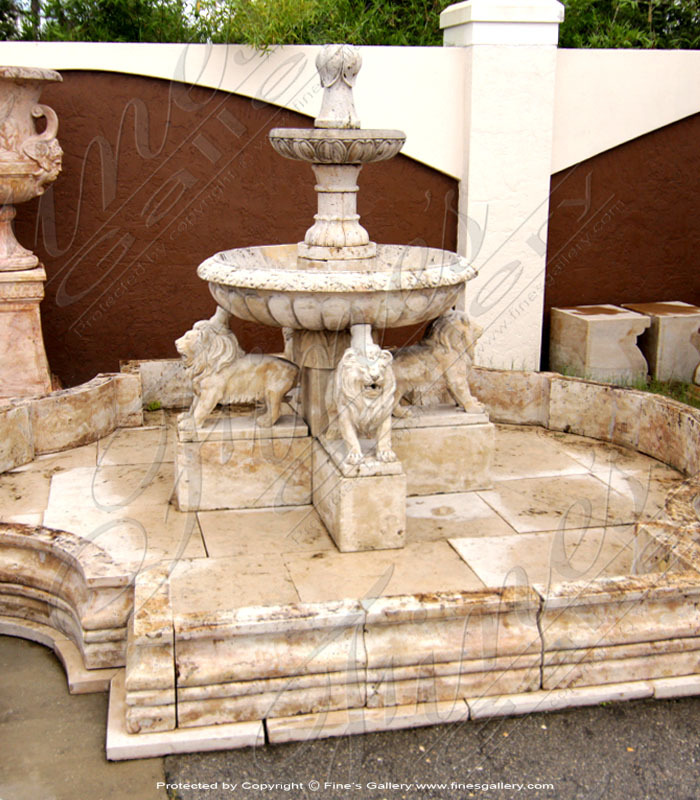 Gorgeous?Grecian females?and lions are displayed within?this 14 foot high fountain.? Popular in white, cream and earth toned marble and granite. 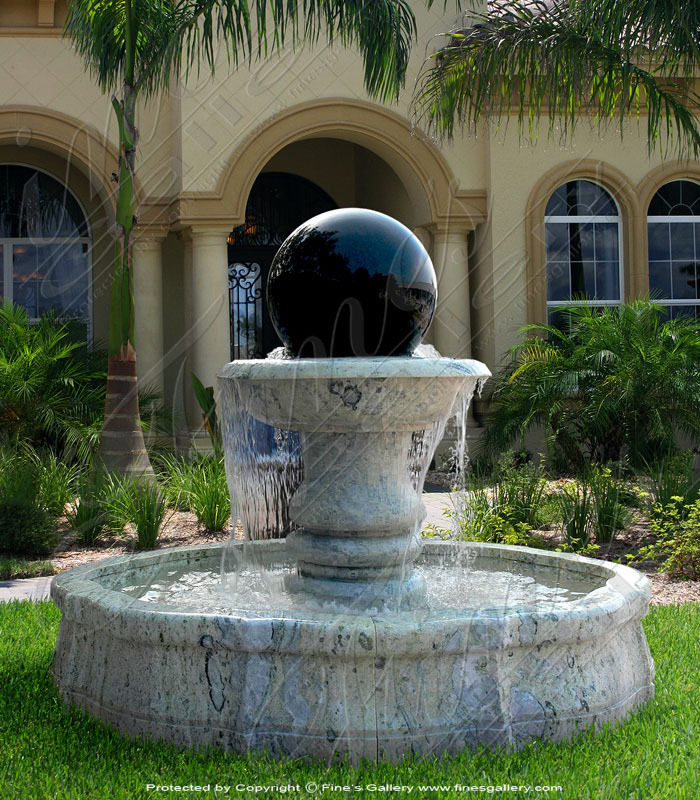 Greco Roman style extra large outdoor natural stone fountain feature. Dimensions: H: 168" W: 171" D: 171" View Colors Call Us! 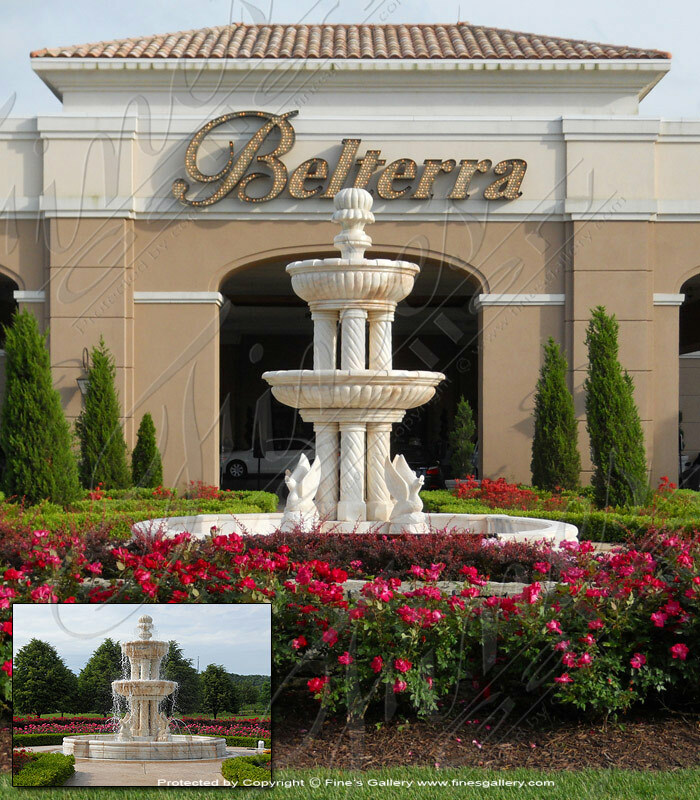 Dimensions: H: 150" W: 189" D: 189" View Colors Call Us! 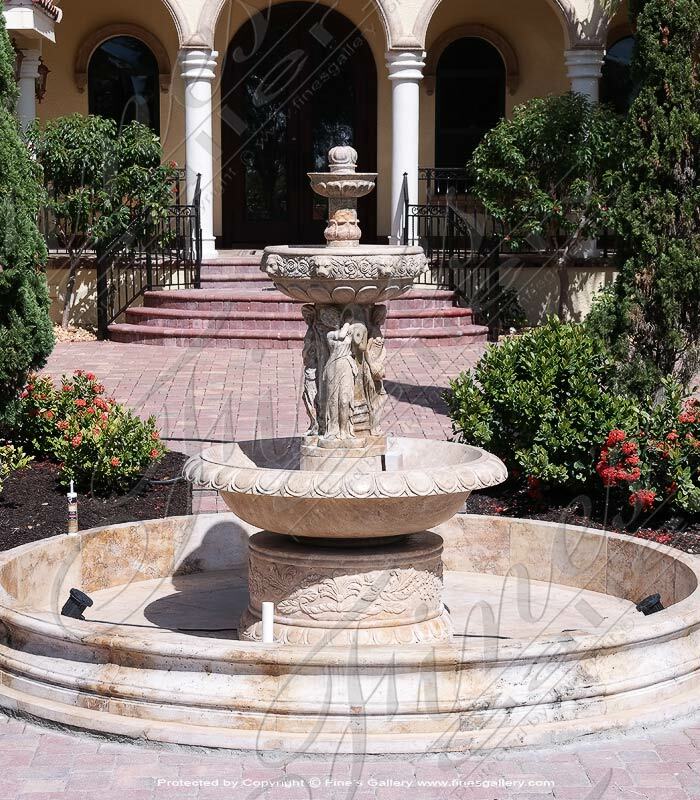 A Monumental Marble Water Fountain featuring a light pink rosetta marble. Supporting each tier are spiral columns. Graceful swans spout water into the marble pool below. 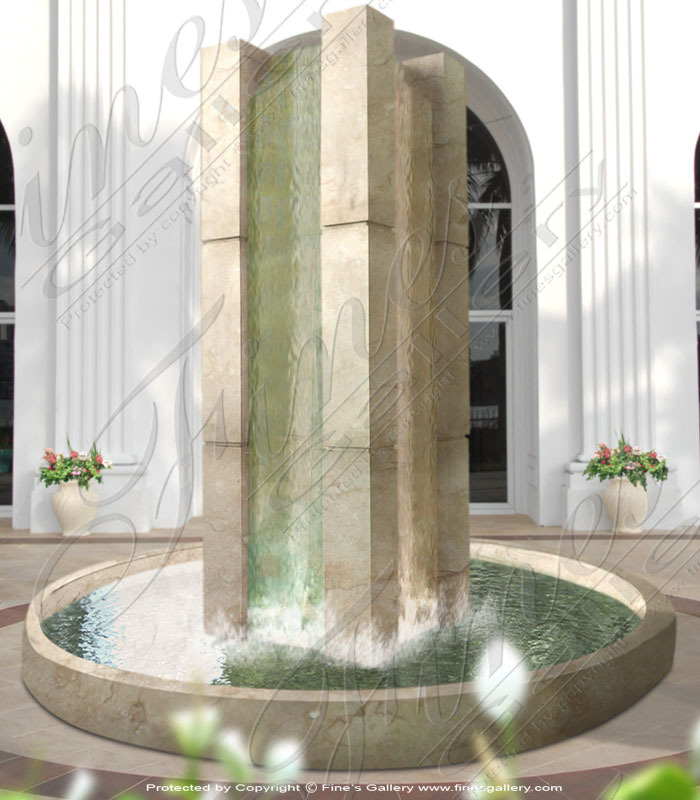 Dimensions: H: 167" W: 212.5" D: 212.5" View Colors Call Us! Three beautiful and graceful female figures all hand carved from one solid block of the finest pure white imported marble. Water spouts from a commercial grade water jet system. Add submersible lighting to create a stunning night time effect. Dimensions: H: 88.75" W: 144" D: 144" View Colors Call Us! 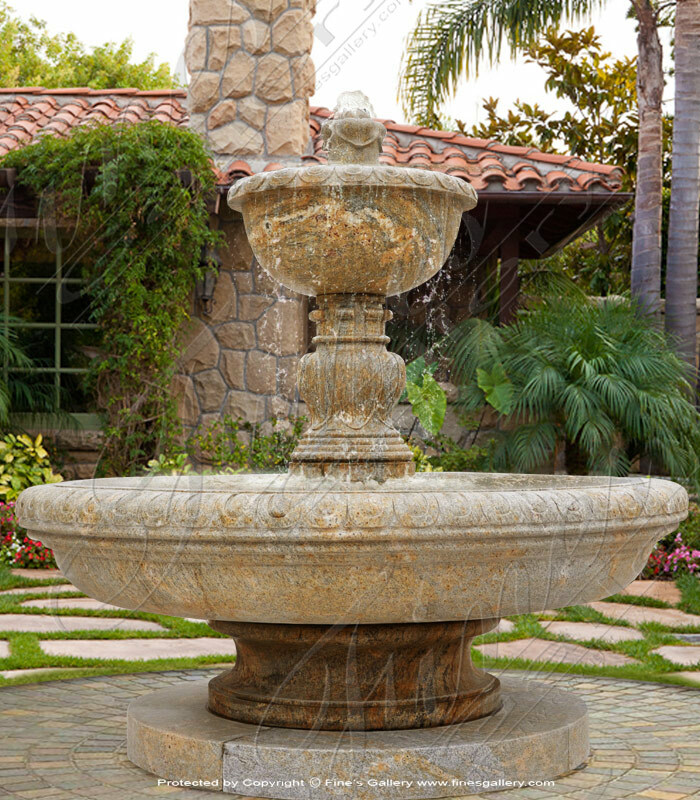 A four rearing horse fountain set inside of matching granite gazebo all set up on a raised granite substructure. Very impressive in size and unique in design. Contact a sale rep today about this item at 1.866.860.1710. Dimensions: H: 188" W: 144" D: 144" View Colors Call Us! 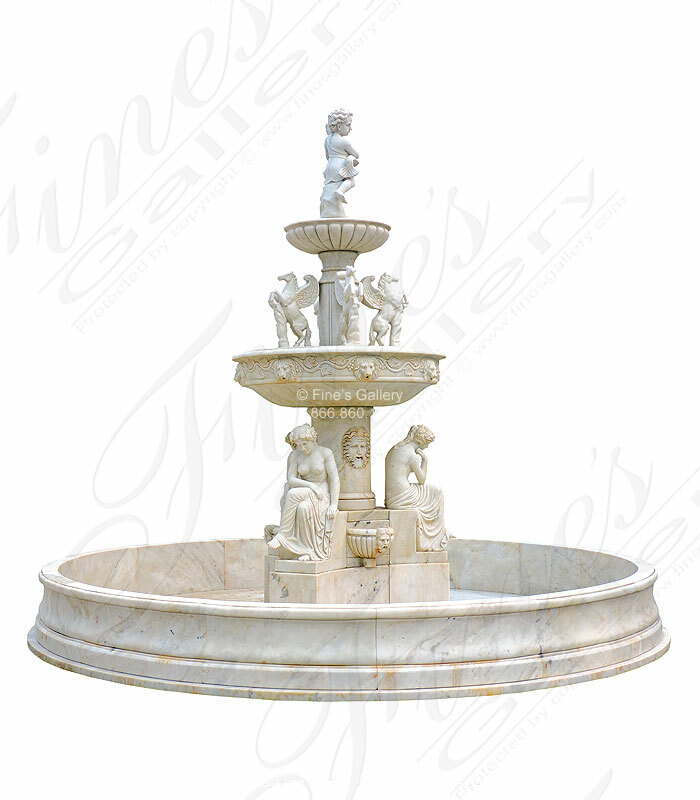 Cream Marble Grecian Ladies Fountain. 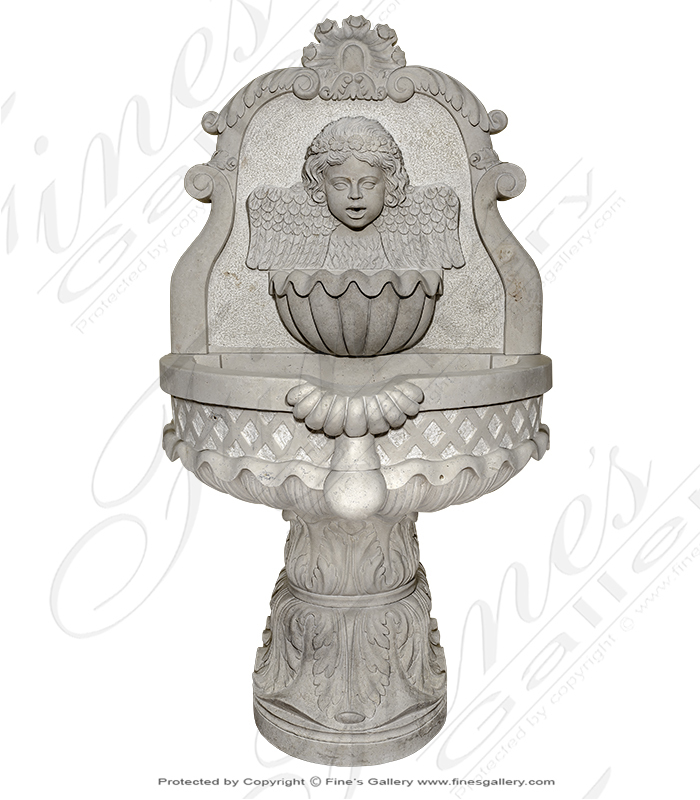 ?Three graceful females sit around the bottom pedestal and support a ornate basin. 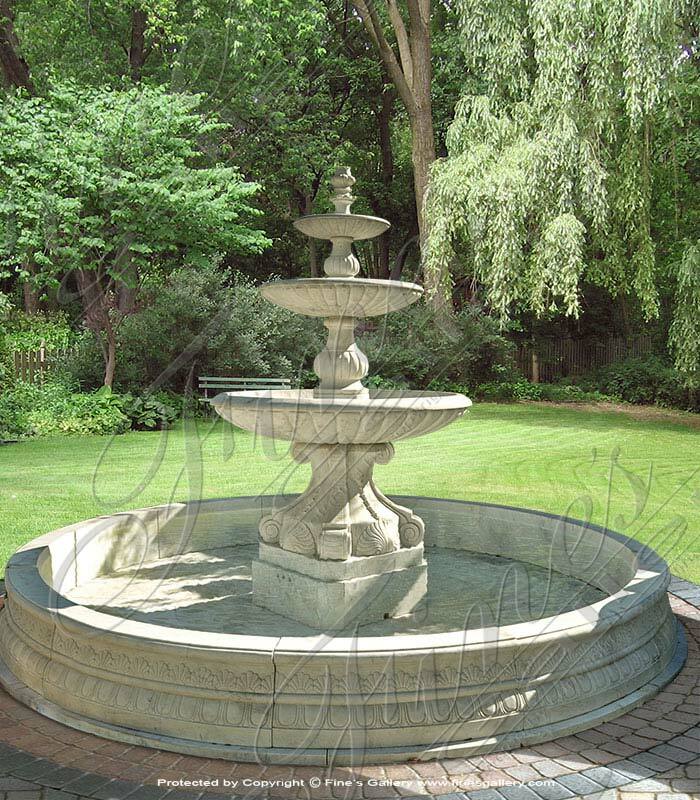 Quatrefoil shaped pool surround adds a unique architectural element to your motorcourt. 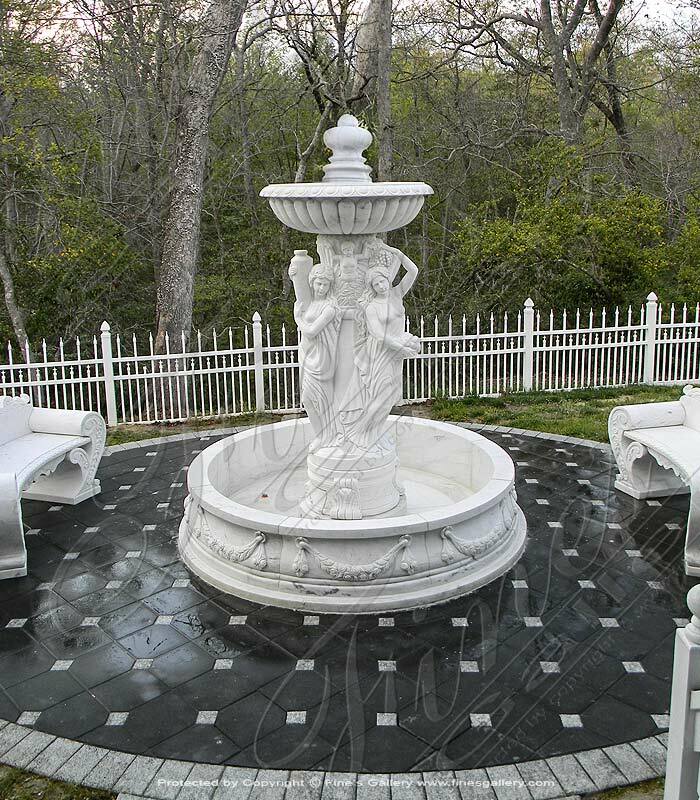 Available in white and pink marble. Dimensions: H: 104" W: 140" D: 140" View Colors Call Us! 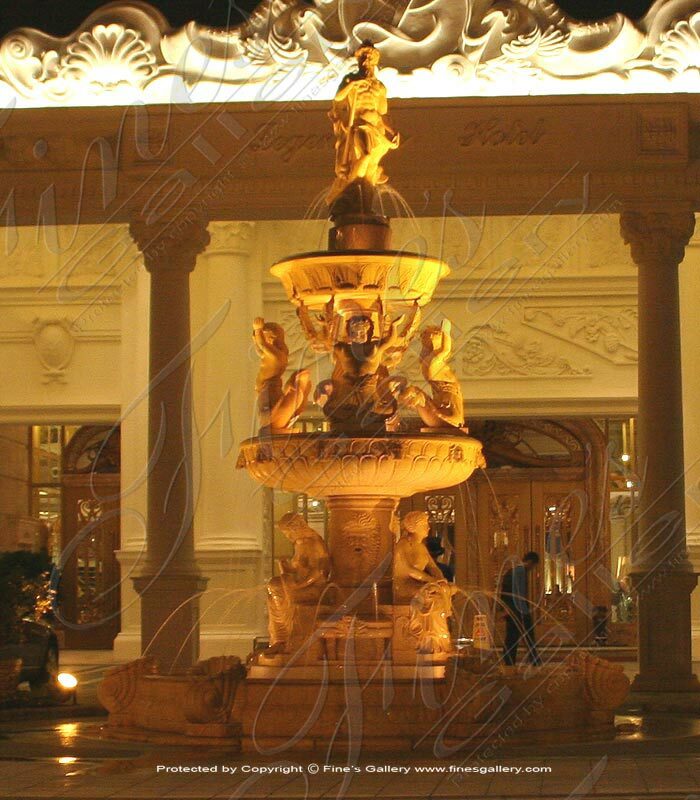 Dimensions: H: 120" W: 120" D: 120" View Colors Call Us! 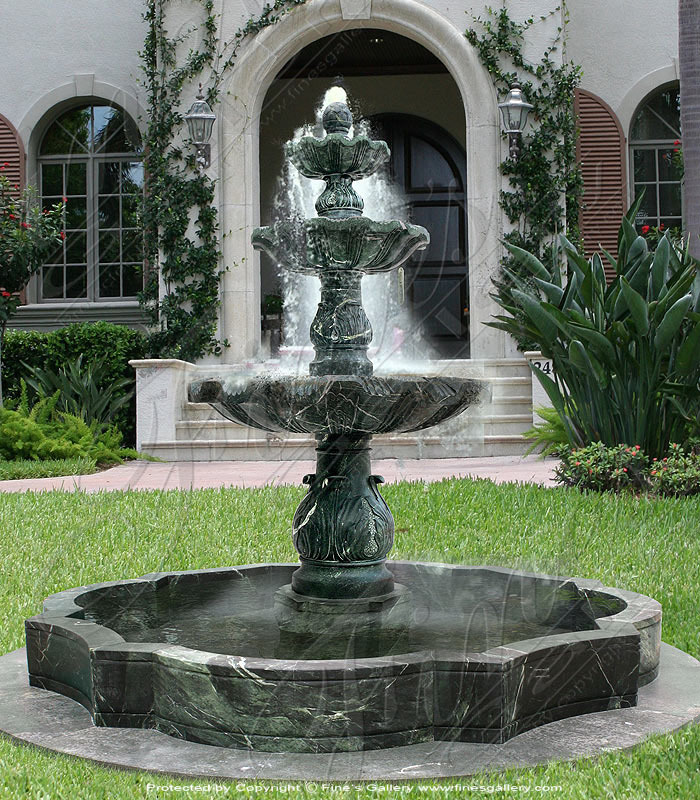 This sophisticated fountain adds a magnificent feeling of timeless elegance to the landscape. 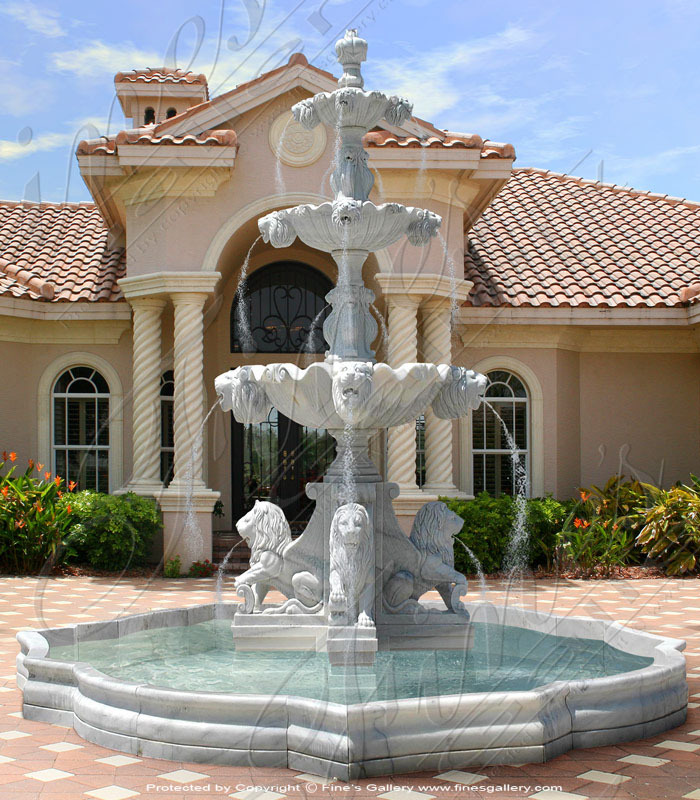 Sculpted from gorgeous fine marble in natural tones, this double tiered fountain features majestic lion statues at its base. 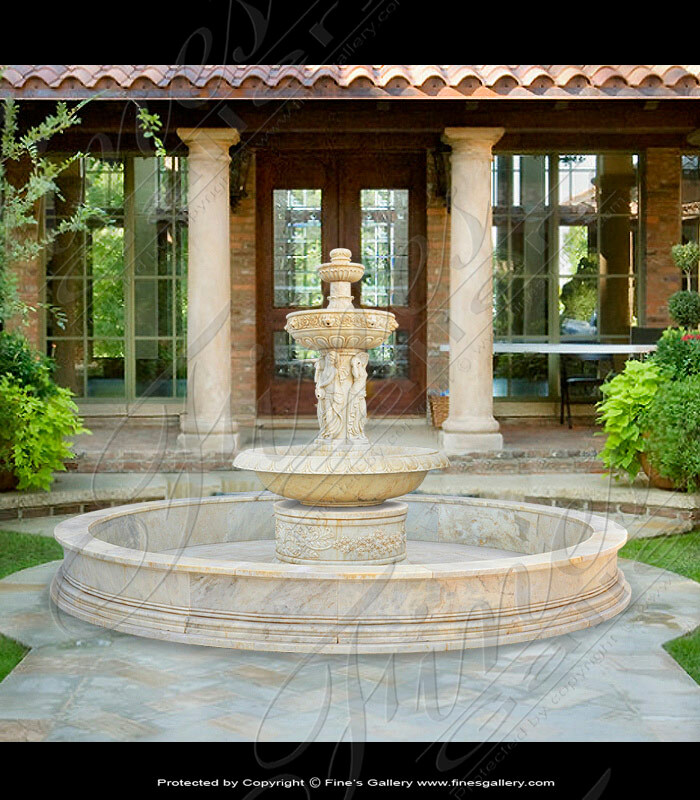 Travertine marble! Dimensions: H: 88" W: 168" D: 168" View Colors Call Us! 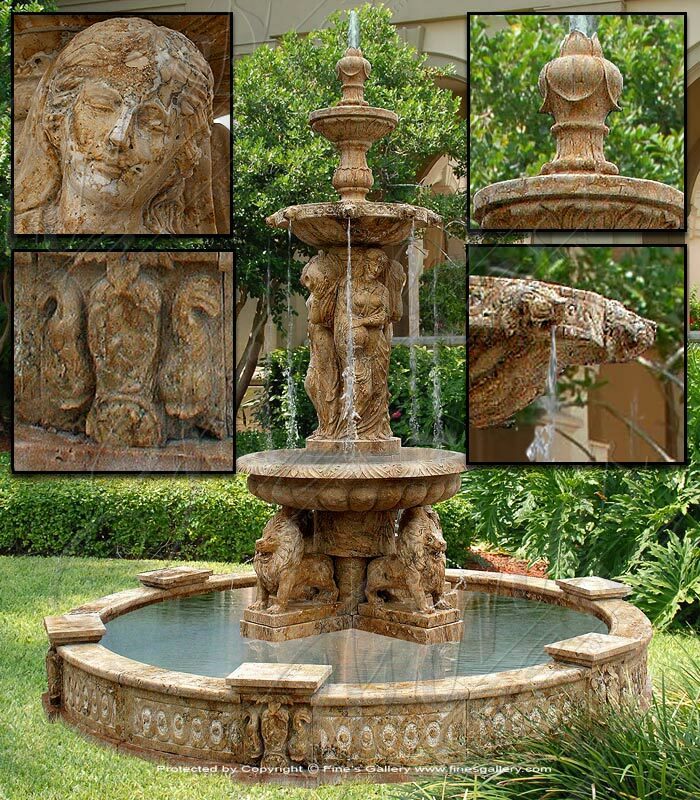 Hand Carved Solid Travertine Four Seasons Marble Fountain. 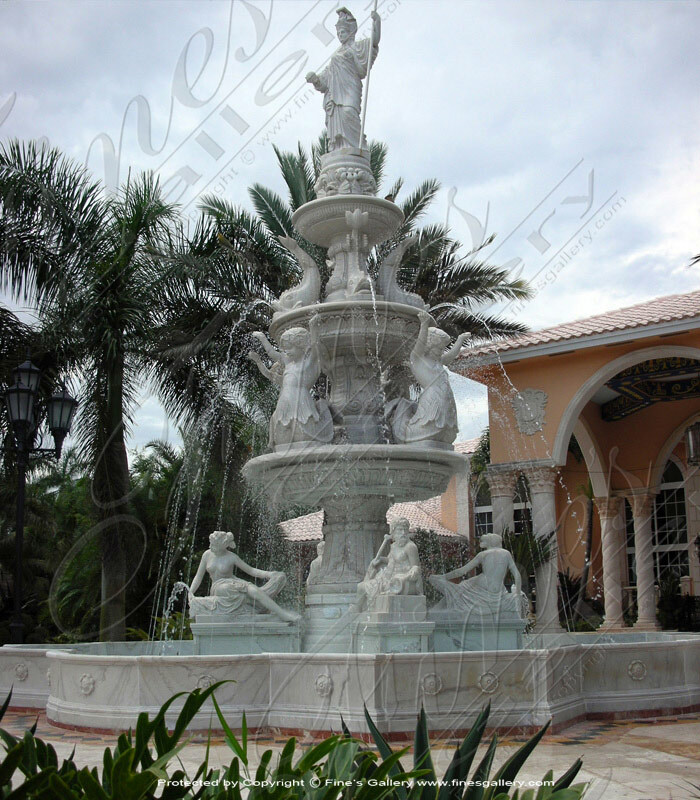 Water cascades from top finial down to second tier and out of the lions mouths. Each of the four maidens carrying jugs is cored out for water flow. Dimensions: H: 96" W: 120" D: 120" View Colors Call Us! 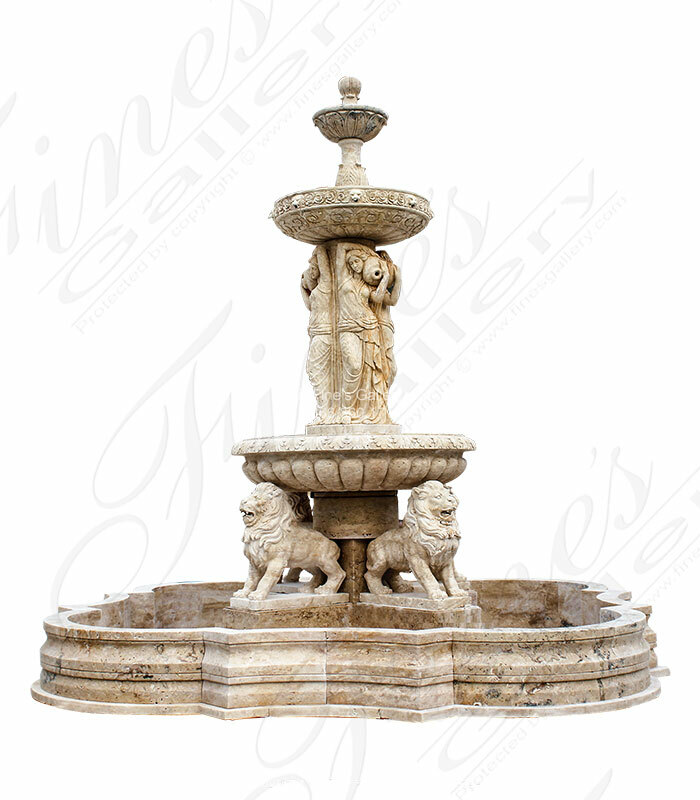 An ornately carved Antique White marble fountain featuring four water pouring maidens, lion head spouts, and floral marble base. Dimensions: H: 92" W: 144" D: 144" View Colors Call Us! 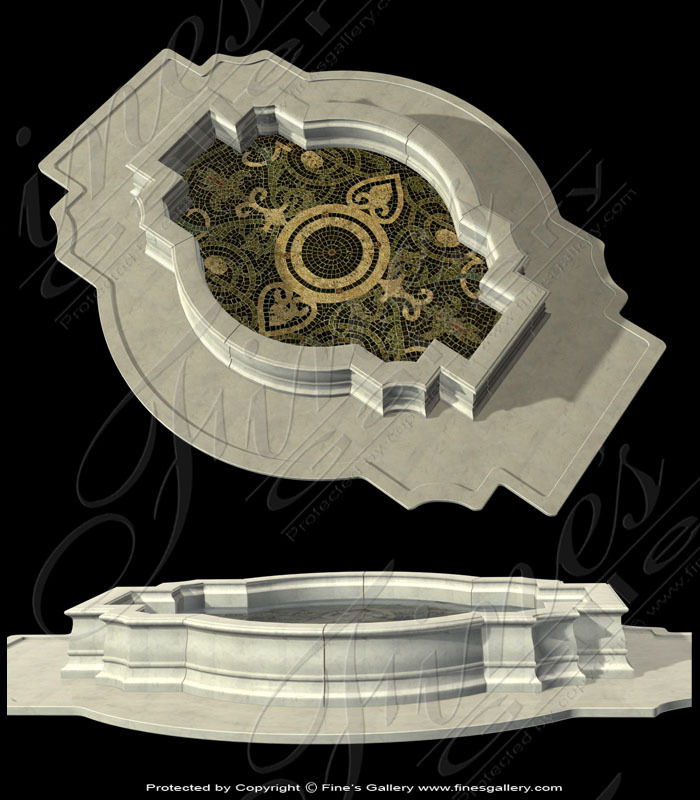 Decorate your favorite place with this magnificent mosaic pool. Grand in size and uniquely shaped, it displays a marvelous mosaic tiled floor on the interior. Call today to customize in size or color and create your dream pool. Dimensions: H: 22" W: 192" D: 156" View Colors Call Us! 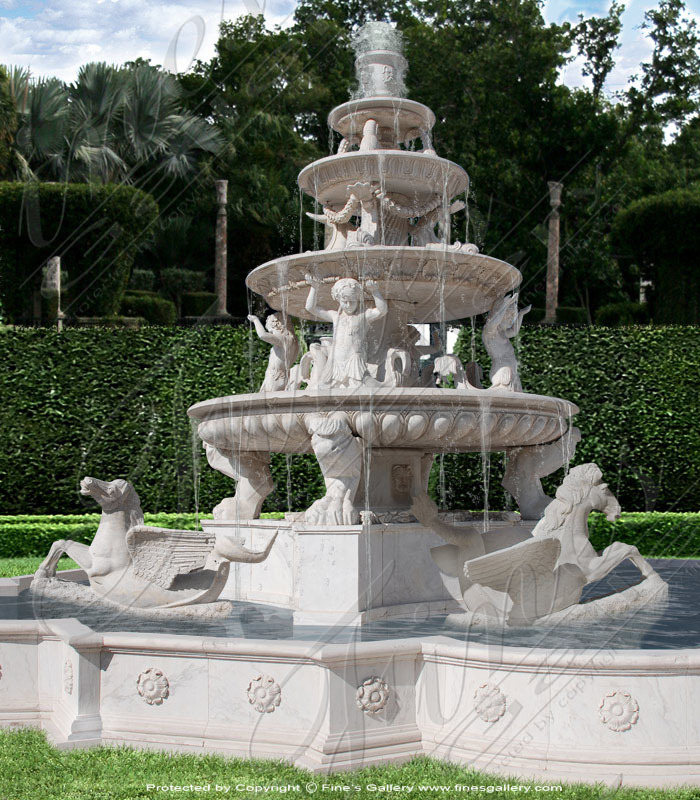 Expertly sculpted from pristine white marble, this Monumental White Marble Fountain is a mythical paradise of towering elegance. Graceful sea nymphs and regal lions add impressions of enchanted intrigue and classical beauty. 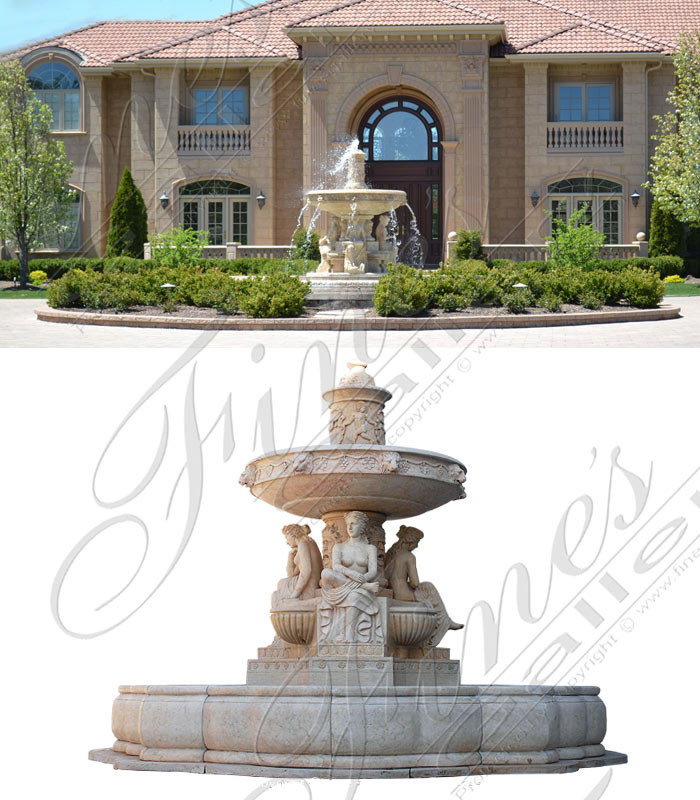 Dimensions: H: 168" W: 360" D: 360" View Colors Call Us! 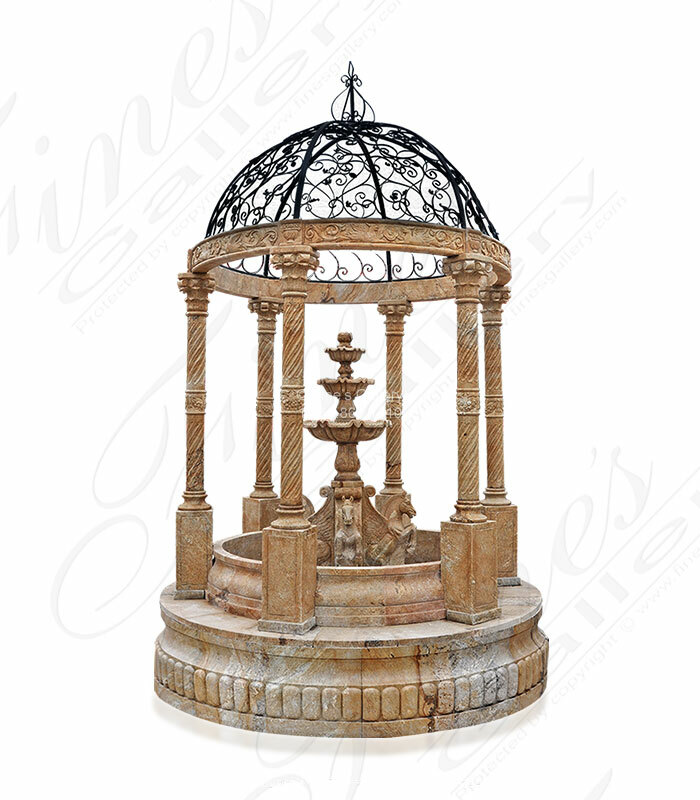 Antique Style Monumental Fountain carved from solid antique gold travertine. 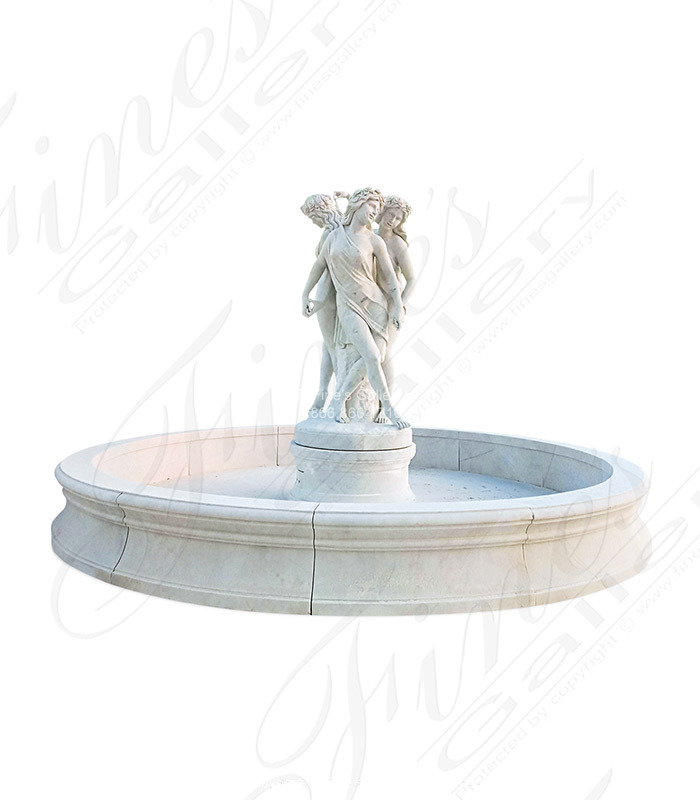 Four grecian female figures are pouring water from their jugs as four lions spout water into the basin below. 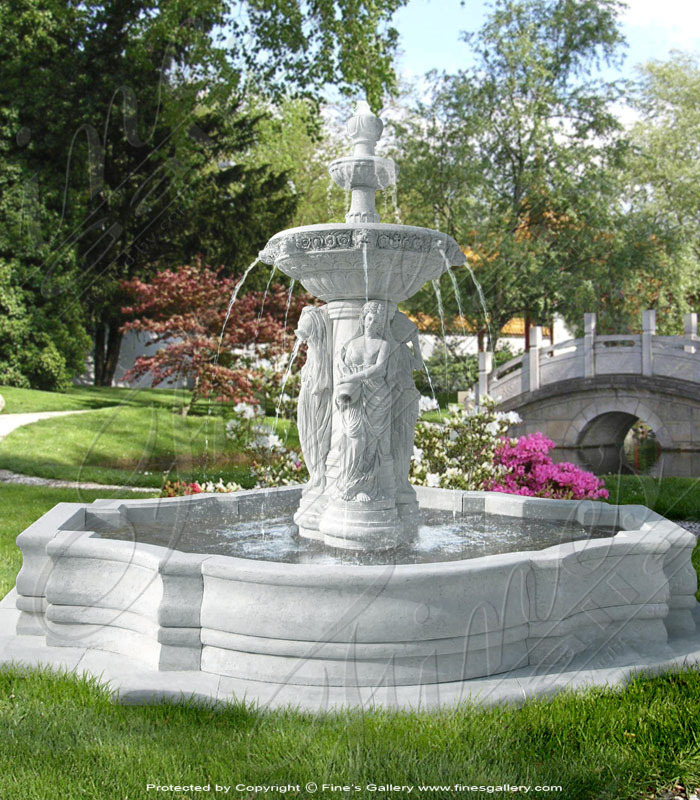 Available in white marble and earth toned granite. Dimensions: H: 118" W: 108" D: 108" View Colors Call Us! Dimensions: H: 187" W: 336" D: 336" View Colors Call Us!